There is now a dedicated Yojimbo importer for Keep It for Mac that will automate the entire process, converting Yojimbo notes, serial numbers and passwords to Keep It notes, and preserving the original format of all other items. Passwords and encrypted items can be re-encrypted as they are imported. Yojimbo collections become bundles in Keep It, tag collections become saved searches, and labels are preserved with their original colors. The importer requires Keep It for Mac 1.4.2 or later, and Yojimbo 2.0 and later. Keep It can already import Evernote ENEX files, Together libraries, and from files and folders, preserving the folder structure and tags, and converting text files to notes if desired. Update: Keep It 1.6 for iPad and iPhone includes the ability to save web pages as web archives, so this workaround is now redundant. Keep It for Mac can save web links as web archives, but due to the lack of the same built-in functionality on iOS, Keep It on iPad and iPhone cannot. 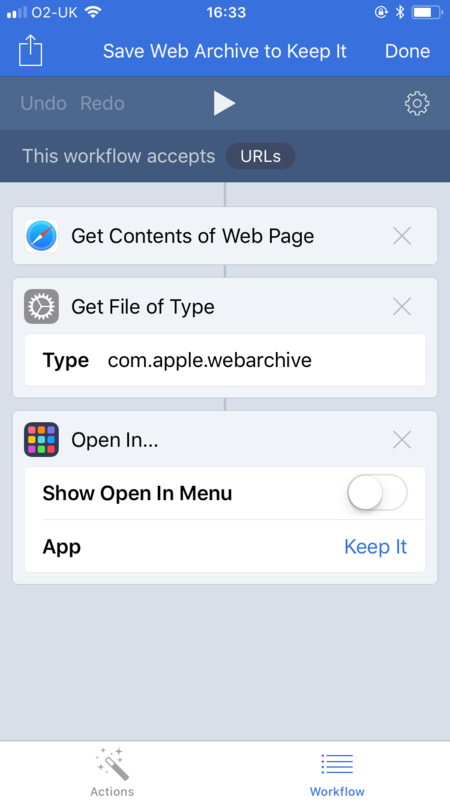 However, it is possible to save a web archive using Apple’s Workflow app (which will become Shortcuts on iOS 12). Keep It will then open and allow you to change the name, add tags, and choose a location. 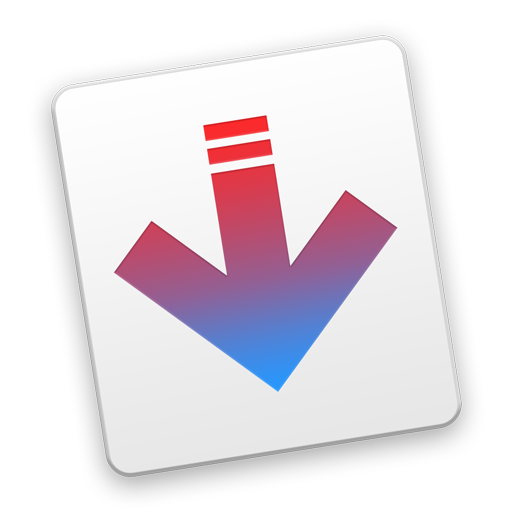 Keep It 1.4 is available today for Mac, iPad and iPhone. 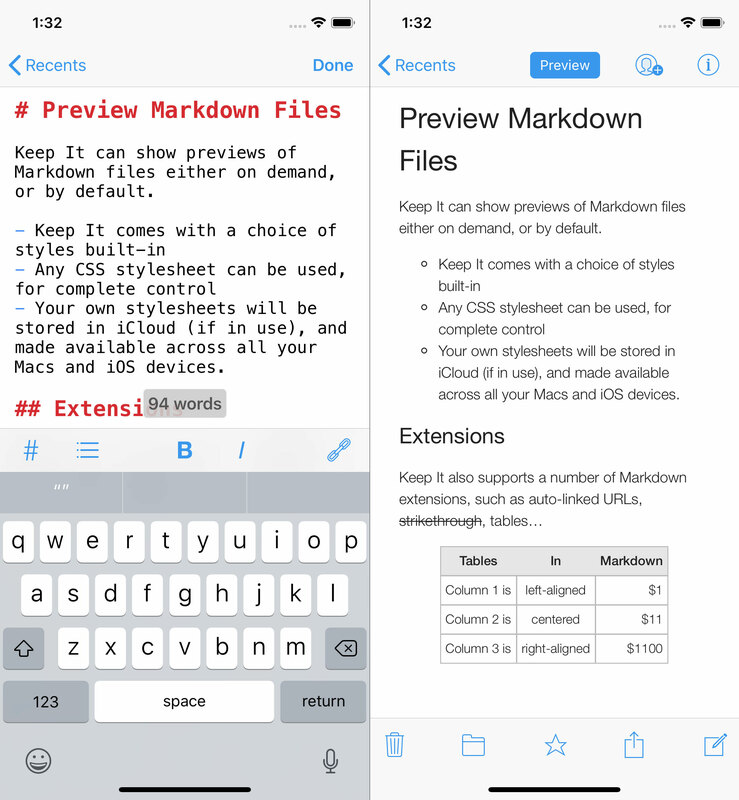 Starting with this version Keep It can now encrypt items, has dedicated Markdown editors with syntax highlighting and preview, can show word counts for notes and other editable text documents, and copy clickable links to lists. 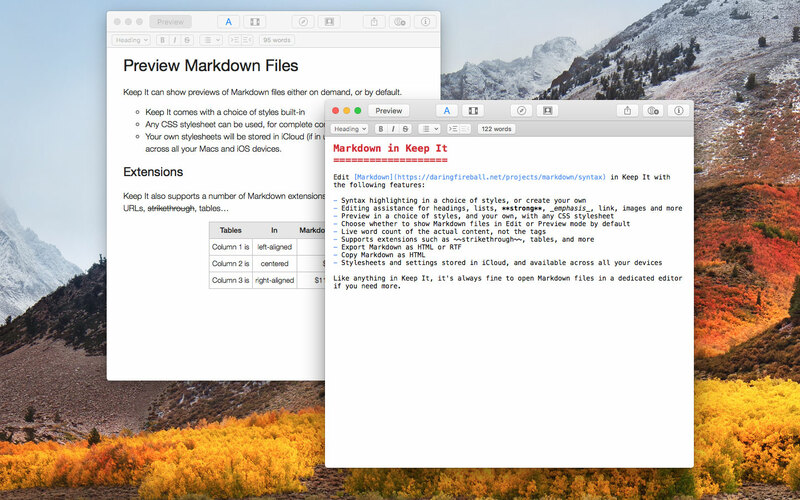 On Mac, Keep It can now open anything in a window, show margins for any editable text document opened in its own window, and navigate the history of viewed items. 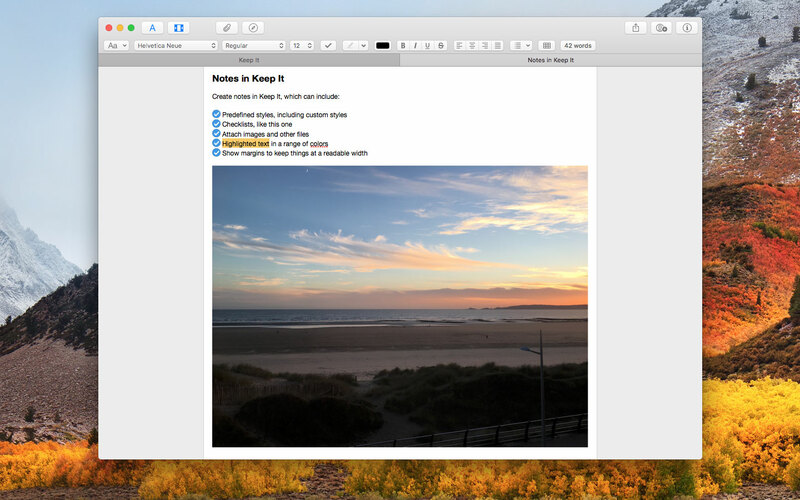 This is the biggest Keep It update so far, particularly for the Mac, and the focus is on making Keep It a great place to edit and view notes, documents, images, video clips and more. Keep It uses the same syntax highlighting engine as MacDown, so any editor style that can be used with MacDown can be used with Keep It on both platforms, and creating custom styles is pretty straightforward. Any CSS stylesheet will work for the preview. Keep It’s aim is to present Markdown files as something more than just plain text, and provide the fundamentals. 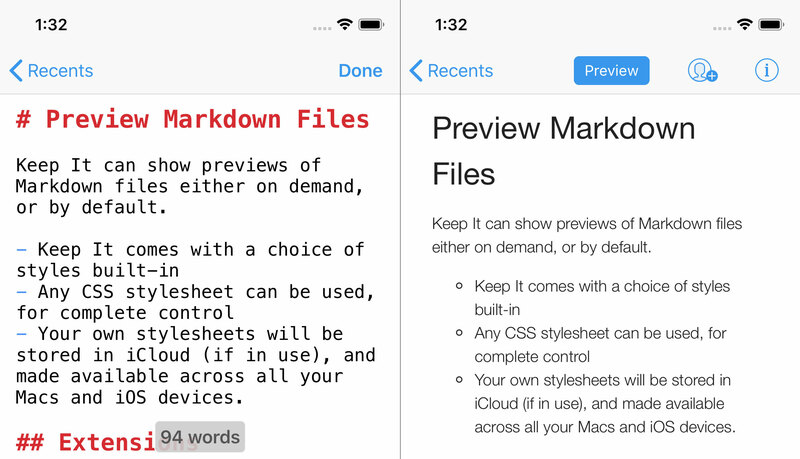 It’s completely fine to open Markdown files in a dedicated editor should you need more than Keep it offers, and similarly if you want a live-updating preview, I would recommend Marked 2 by Brett Terpstra. Individual items can now be encrypted with a password, and temporarily viewed with the password, Face ID or Touch ID (including on MacBook Pro with Touch Bar). Encrypt items with the Item > Encrypt menu item or optional toolbar button on Mac. On iOS, tap the activity button and tap Encrypt. Keep It for Mac will re-encrypt previously encrypted files in the new format when importing Together libraries, and both Keep It for Mac and Keep It for iOS will offer to decrypt files whenever you export them. Keep It strives to use standard file formats whenever possible. Encrypted files in Keep It are Zip files that use AES-256 encryption and can also be opened in apps that support that format, such as The Unarchiver. Keep It for Mac can now navigate back and forth between items you’ve viewed. Navigate with the Go > Back and Go > Forward menu items or their key equivalents, using the optional navigation toolbar item, or the Touch Bar. Anything can now be opened in a window (or tab) in Keep It for Mac. By default, items will still open in their original applications, but this can be reversed by holding on the Command key while double-clicking an item, and the default changed in General preferences. In addition, new items created from stationery will either be opened in a new window or selected in the list, depending on the setting in General preferences. When opening any item with editable text in a separate window or tab on Mac, Keep It can now show margins to constrain the width of the text to aid readability. Drag the margins to set a maximum width, which will be remembered even when the window is temporarily made narrower. This is particularly useful when editing in a tab or full screen. On macOS High Sierra, Keep It for Mac can now show a word count and other statistics such as the number of characters, sentences and paragraphs in notes and rich text files in the format bar. Click the text info button in the format bar to see a popover of statistics and choose what to show in the format bar. Drag the popover to turn it into a floating window. Keep It for iPad and iPhone can show a word count below the text. Show this by tapping the activity button and choosing Show Word Count. Tapping on the word count will let you choose whether to show the number of characters, words, sentences or paragraphs. On Mac, there is now a table button in the format bar for notes and rich text documents, and both Mac and iOS have improved previews for video and audio files. Notes can now be exported in a range of formats on iOS, as on Mac. When importing Mail messages, Keep It can now use the date sent and date received as the creation and modification dates of items on both Mac and iOS. Copy clickable links to lists using the right-click menu on Mac, or swiping left on the list and tapping the … button on iOS. It’s also possible to copy clickable links to items in the item list in the same way. See the release notes for Mac and the release notes for iPad and iPhone for a full list of changes. Keep It 1.4 is a free update for all existing customers.